Sportscasters and news media are writing about Garrett Adcock’s intelligence, versatility on the football field and most of all about his compassion and extensive community service. Photo on right courtesy of UNM Communications. 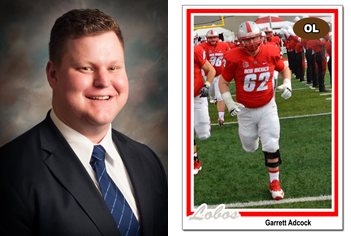 Garrett Adcock (’18) has been in the news for his intelligence, versatility on the Lobo football field, and most of all, for his extensive community service. He is currently the only junior football player in the country enrolled in law school. For his performance and dedication in the team’s strength and conditioning program, Adcock was named the 2015 Spring Camp Hard Hat Champion. He came to UNM intent of becoming a doctor, but after some persuasion by his mother and researching the prospect, Adcock decided to attend law school. “A legal education gives me the greatest opportunity to effect global change,” he says. “Adcock seemed passionate when talking about the importance of government structure and civil and constitutional rights. He said, despite the stereotypes, a career in law is truly a noble calling,” Robert Maler writes the Daily Lobo article, Football: Adcock excels in the classroom and on the field. Most of the news stories are about Adcock’s impressive service ethic and how he improves the lives of others. He’s been on three separate mission trips to Ateiku, Ghana, to open a hospital in the region. He worked in the pharmacy to serve over 3,000 patients on the first day the hospital functioned. He helped build a school for children and drilled a well in an outlying village. The program is currently in need of a leader who has an understanding of public policy and the political system. Adcock hopes that with a legal education, he can make more of an impact there. He also went on a mission trip to New Orleans to help Hurricane Katrina victims. He volunteers regularly at Joy Junction and Copper Pointe Church’s Kid Ministry in Albuquerque. He served as a personal coach to Special Olympics athletes, held weekly football camps at an underprivileged elementary school and worked in a warehouse to provide food to the needy. Adcock’s extensive community service was recognized nationally in 2015, when he was a semifinalist for Wuerffel Trophy from the National College Football Awards Association. The award goes to the college football player who best combines exemplary community service with athletic and academic achievement. An Albuquerque Journal headline also pays tribute to his service -- “UNM lineman Adcock is intent on making the world a better place” by Assistant Sports Writer Ed Johnson. After law school, Adcock has his sights on not just one more degree, but two degrees – an MBA and a Master of Philosophy in Evidence-Based Social Intervention and Policy Evaluation. And not just anywhere – at Oxford University, ranked second in the world university-wide and first in the world in clinical, pre-clinical and health and life sciences.